The Carnegie Medal is awarded each year to one outstanding new book for children or young adults. 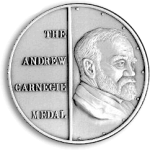 The Medal was named after the Scottish-born American philanthropist Andrew Carnegie. The Carnegie Medal is the UK’s oldest and most prestigious book award for children’s writing. No Award was given in 1943, 1945, or 1966. That is because no book was considered suitable. Learn more: official Carnegie Medal homepage. The Swallows, Amazons and D’s are prospecting for gold on High Topps, hoping to persuade Captain Flint to stay home as he returns from a South American gold prospecting trip. When the Germans invade their island in the English Channel, Mick and Caroline Templeton get left behind in the confusion. The last four gnomes in England live by a brook in Warwickshire. When Cloudberry does not return from an exploring expedition, the other three set out to find him. Dinah and Dorinda determine to be naughty while their father is away. As Maria arrives at Moonacre Manor she catches a glimpse of the little white horse. In which we meet Arrietty, Pod and Homily Clock, a family of small people who live behind the wainscot and under the floor. A collection of short stories and fairy tales. Tirian, the last king of Narnia summons Jill and Eustace to his aid when his kingdom is overrun by the Calormenes. While waiting out quarantine for measles, Tom stays with his aunt and uncle in an old house and discovers he can enter the past through the garden at night. On his way to a vacation visit, Ping visits the London Zoo and discovers Hanno, the gorilla - whom he meets unexpectedly at Green Knowe.